When considering “value wines” for holiday imbibing — highly drinkable wines with attractive price/quality ratios — New Zealand (NZ), especially its copious, often palate-rocking Marlborough Sauvignon Blancs (SB), deserves to be in the discussion. About the size of California, NZ has only 4.5 million people, but it’s the world’s 13th largest producer of wine, the majority of it (mainly Sauvignon Blanc) geared to export. In fact, at a holiday reception the other day, I was speaking with a newly arrived New Zealand diplomat who expressed amazement not only at the number of NZ wines available in New York City wine shops (entire shelves of SB in some cases! ), but also their bargain prices relative to the domestic NZ market. More often than not, I have a screw top NZ SB in my fridge for everyday drinking, based on the dependable quality at a fair price, like Brancott ($12.99) or Oyster Bay ($13.99), both of which are nationally distributed. Another widely available label that needs to be the value conversation, however — and not just for SB — is Mud House. Mud House was founded in 1996 by a British couple who fell in love with New Zealand while sailing around the world. They first planted SB vines in Marlborough, and used the local earth to build their home (hence, “Mud House”). 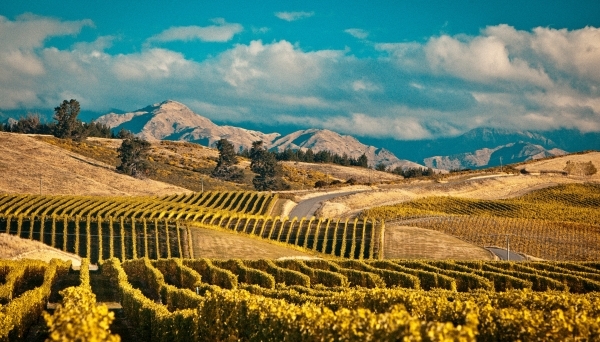 Two decades later, Mud House is a relatively large producer and exporter of quality varietal wines (owned by Accolade Wines), with vineyards situated across three regions of the South Island (Marlborough, Waipara Valley and Central Otago). It also has three distinct product ranges — the basic (least expensive) Mud House, Mud House Estate and Mud House Single Vineyard — covering seven varieties: SB, Chardonnay, Riesling, Gewürztraminer, Pinot Gris, Pinot Noir and Merlot. I recently had the pleasure to meet and dine with Mud House’s Brand Ambassador, Jack Glover, at the Park Avenue Autumn restaurant in Manhattan. A tall, friendly and even-keeled New Zealander who grew up in the wine industry, Jack brought along the wines that are — or will be — in the US market, along with one that is not. As with most NZ wineries, SB is the bread and butter for Mud House. Propelled by Cloudy Bay, which released its first vintage 1985, “Kiwi” SB burst on to the international scene in the 1990s, the result of immediate terroir alchemy between grape and place, especially in the Marlborough region (in the northeast corner of the south island). Shielded from the westerly maritime moisture by the Tasman Mountains, Marlborough is consistently cool and sunny, with a long ripening season and poor, pebbly soils, ideal for SB. Here, Sauvignon takes on a more intense, often tropical fruit character, along with more ripeness, extract and body than most other locales, but without losing the refreshing acidity and herbaceous qualities its known for in, say, France’s Loire Valley. But in some cases, says Glover, NZ SBs can have over-the-top tropical fruit, with too much ripeness and alcohol, making them tiring to drink. Mud House consciously pursues a more nuanced, restrained and earthier style, with notes of jalapeno chilis and green fruits in the palate. We sampled two Mud House SBs. The first was the basic Mud House Marlborough Sauvignon Blanc 2014, produced from fruit grown on its own Woolshed vineyard, and from long-established growers in the Awatere and Wairau Valleys (totaling around 150,000 cases a year!). With notes of sugar snap peas, earthy jalapeno and pink grapefruit, the nose is garden-like, followed by a bright, minerally and grapefruit palate, finishing dry and long. Nicely balanced, excellent quality juice for $13.99 retail — great as an aperitif or with seafood, especially oysters. This vintage is just now hitting the US market. In fact, there is still some of the 2012 vintage in my upstate shop (Sipperly’s, in Red Hook), but I’m happy to report that it’s still drinking well, too. Next, we had the Mud House Estate Woolshed Vineyard Marlborough Sauvignon Blanc 2013. A single vineyard wine from two specific lots in the Woolshed vineyard — one on the flats, consisting of loamy, gravelly soils, the other, on clay-dominated slopes — this is a wine of depth and layers. A citrusy, passion fruit nose precedes a clean, crisp and juicy palate full of passion fruit, citrus and green chili flavors, finishing long and earthy. At $18-20, this SB is also a relative bargain, one that paired perfectly with a raw black kale salad with chorizo and Manchega cheese (and a Champagne vinaigrette). It’s scheduled to arrive in the market in January, albeit in much smaller quantities than the basic Mud House SB. After tasting the Mud House Waipara Riesling 2013 for fun — it’s not in the US market, but it clearly shows that Riesling also does well in New Zealand — we moved on to the Mud House Central Otago Pinot Noir 2013. A deep ruby, with dark berry fruit, subtle spice and dried herbs on the nose, this Pinot is elegant, balanced…and delicious, sporting a palate of pretty briar fruit, with herbal undertones. Blended from multiple parcels from the Bendigo sub-region of Central Otago, 30% of the wine was matured in new oak, the rest in stainless steel tanks to retain the compelling fruit character. The overall result is an accessible, food-friendly wine with nuance and complexity — a dynamite pairing for roasted Long Island Duck with butternut squash and Maitake mushrooms. When it arrives in January, expect to pay $26-28 retail, a steal for a Pinot of this pedigree. This entry was posted in Eco-friendly Products, New York City, Restaurants, Wine, Wine + Food and tagged Jack Glover, Mud House Central Otago Pinot Noir 2013, Mud House Estate Marlborough Sauvignon Blanc 2013, Mud House wines, New Zealand Sauvignon Blanc, New Zealand wine, Park Avenue Autumn NYC, Sipperly's Grog Shop. Bookmark the permalink.